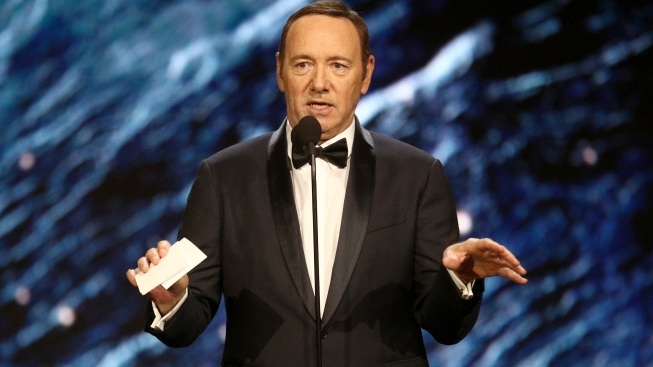 In this Oct. 27, 2017, file photo, Kevin Spacey is seen onstage presenting the Britannia Award for Excellence in Television at The Beverly Hilton Hotel in Beverly Hills, California. Los Angeles County prosecutors Tuesday declined to file criminal charges against a trio of celebrities who were accused of sexual assault -- Kevin Spacey for an alleged 1992 assault in West Hollywood, Steven Seagal from an allegation dating back to 1993 and Anthony Anderson for allegations that arose over the past year. Prosecutors cited the statute of limitations in the Spacey and Seagal cases, but in the allegations against Anderson, prosecutors said the alleged victim "declined to be interviewed,'' and therefore there is a "lack of sufficient evidence'' to proceed with a case.